Recently, I made a gorgeous traditional style lap quilt for a young lady's Bat Mitzvah. This quilt was commissioned by her loving grandmother. She wanted to giver her granddaughter something very special on this most special occasion. Typically money is given, but the grandmother wanted a gift. Shown to the left is the "Keeping Quilt" that the grandmother and I designed. Scrabble playing, and story-telling about an elephant named Ellio Dellio would not be forgotten. I knew I wanted these precious memories kept alive so I found Memory Quilts by Molly and the owner, Molly Fisher, began to weave her magic. 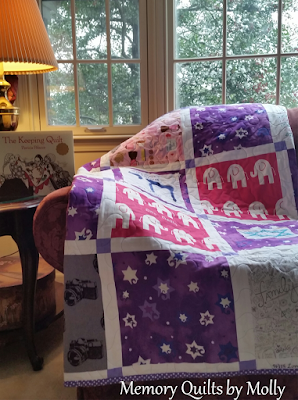 Through fabric, she created a " Keeping Quilt" for my granddaughter to wrap herself in our cherished memories. 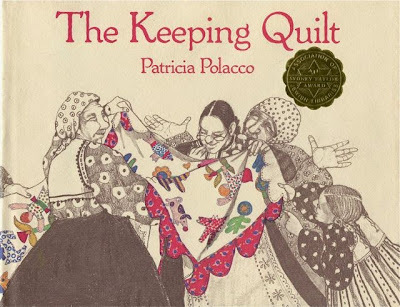 Having read Patricia Polacco's book entitled " The Keeping Quilt", I learned about her family's journey and her family's keeping quilt. for generations to come-a family heirloom, to be sure! Thank you Molly Fisher"
Memory Quilts have been around since the 1700's! Make your Chuppah even more beautiful! Add a custom Memory quilt made with fabric from all of your guests! In Jewish weddings, a bridal couple is covered by a canopy during the ceremony. The Hebrew word for this canopy is chuppah (diversely transliterated as huppah, huppah, chuppah, chupa, chuppah, hoopah. A client recently had her wedding and the wedding quilt that I made for her featured in Green Wedding Shoes! 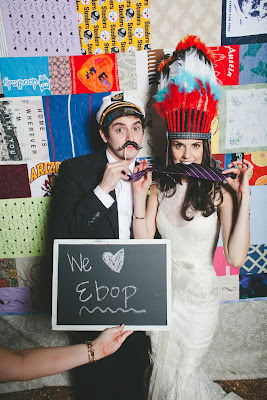 Below is the link to the beautiful feature and her beautiful wedding quilt! I am mentioned in the 2nd paragraph! for prompt consummation (yikes!). By the Middle Ages, the tent was a piece of fabric suspended over the couple during the ceremony . And so it has remained. 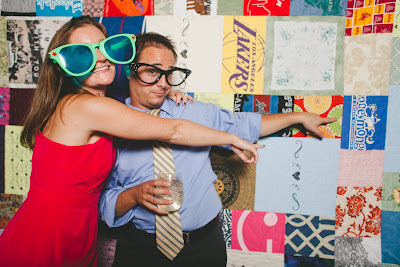 You can use the Wedding Quilt as the backdrop in your photo booth too! to booths have a very plain (almost ugly) blue vinyl background for all of the photos that are taken of your very special guests! Why not jazz the background up with a beautiful memory quilt! If your guests supply pieces of fabric for the quilt-even better! Their picture can be taken in front of their block!